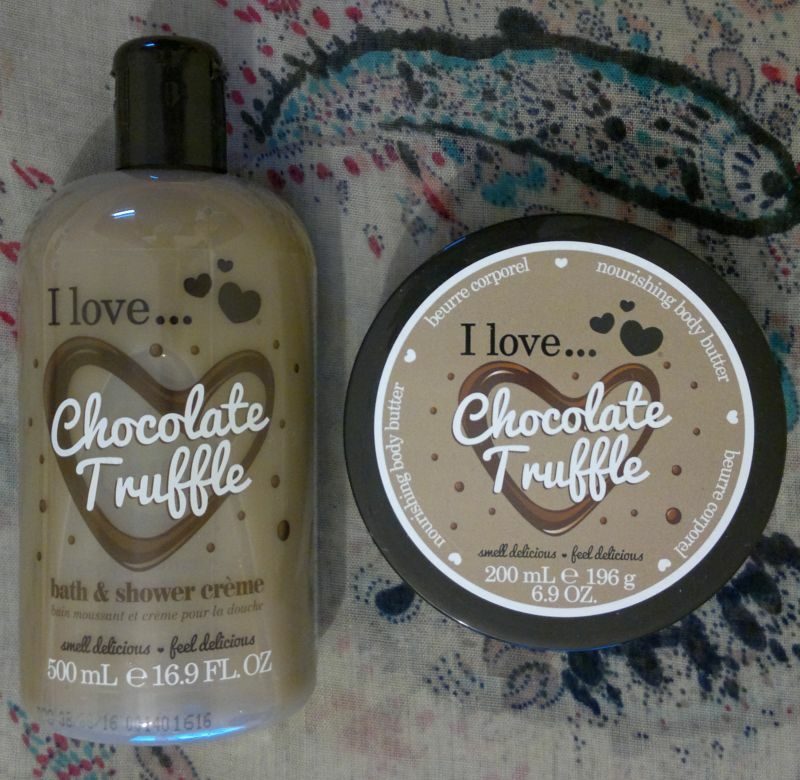 Let’s start with I Love…’s Chocolate Truffle Bath & Shower Crème! I think this shower cream is amazing. The chocolate truffle fragrance is simply delicious! But there’s more! This shower cream produces the perfect lather, and it doesn’t feel drying at all. Great stuff! I Love…’s Chocolate Truffle Nourishing Body Butter is one of the best body butters I’ve ever tried. It’s rich and nourishing. However, it’s not sticky! And the chocolate truffle fragrance is 100% awesome! 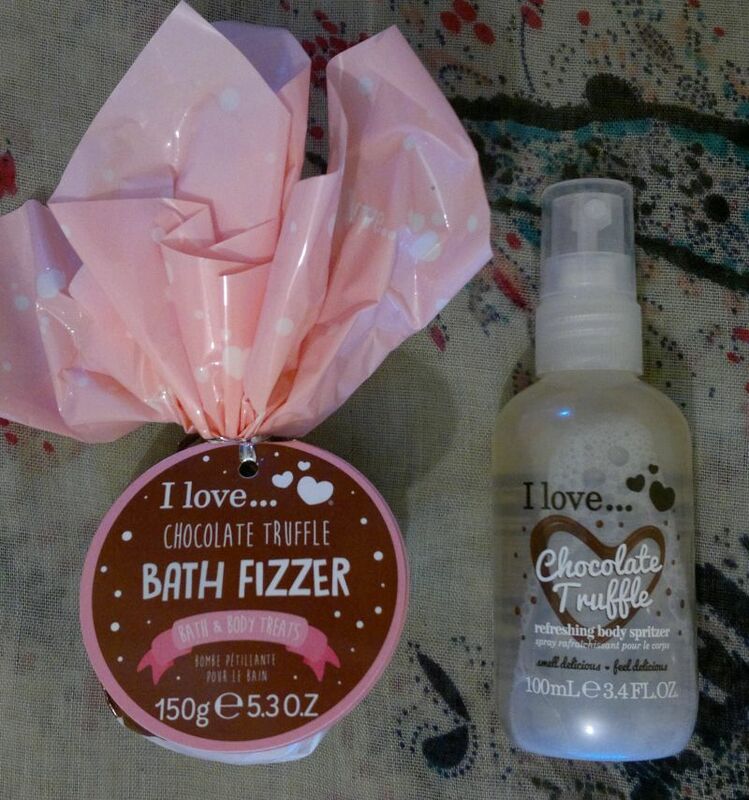 I Love…’s Chocolate Truffle Bath Fizzer is kind of a dud. This bath fizzer hardly smells of anything. I’d describe the fragrance as carton with a hint of bottom shelf milk chocolate. Disappointing! I Love…’s Chocolate Truffle Refreshing Body Mist is really lovely! It’s not the most longlasting fragrance – but I wouldn’t expect a body mist to last all day anyway. In any event, this body mist smells lovely, and the yummy chocolate truffle fragrance lingers on my scarves. Wonderful! Most of these products are only available as part of gift sets (I’ve seen Chocolate Truffle gift sets at TK Maxx just days ago). However, I managed to buy about 8 single tubs of this fantastic body butter (Poundworld). Have you tried these products? Or would you like to try them? Feel free to comment. And thanks for reading! Hi there! I’m a big fan of Boots’ Extracts collection. So I’ll be reviewing two products which have been lurking in my bathroom cabinet for quite a while. Meet Boots Extracts Cocoa Butter Body Wash & Bath Cream. In summary, both products promise to cleanse skin gently, and to leave skin feeling soft, smooth and moisturised. I really like the body wash. The fragrance is absolutely delicious (more expensive high street brands should take note). It’s the perfect cocoa butter fragrance. I also like that this body wash lathers up nicely and that it really makes my skin feel soft. Yes, this body wash is gentle and it’s not drying at all. 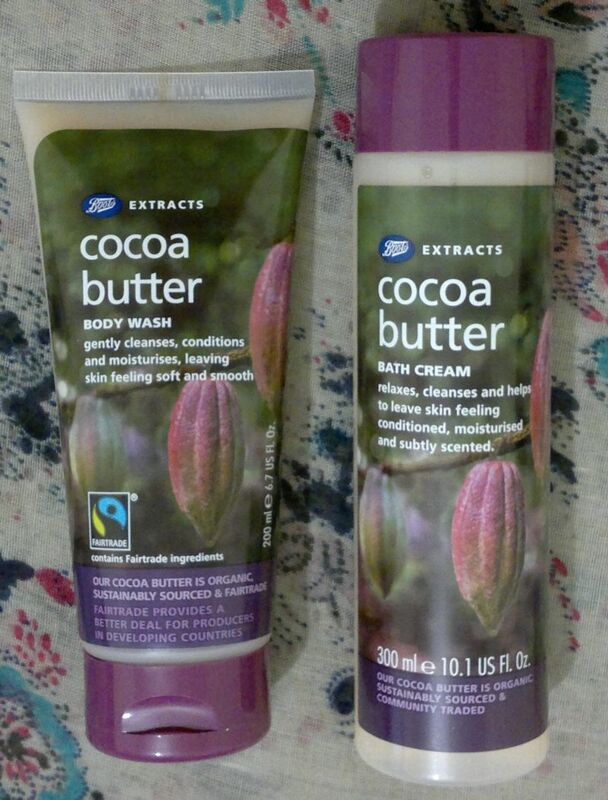 Boots Extracts Cocoa Butter Body Wash has been repackaged and it’s available as 200ml for £4. If you haven’t tried it yet, you really need to change that! And don’t forget to pick up the matching body butter! The Bath Cream has been discontinued – which is very unfortunate. Hi there! Since I enjoy so many Palmolive products, I thought I’d tell you about three more favourites of mine: Palmolive Ultra Moisturisation with Olive and Moisturising Milk, Palmolive Pampering Touch with Coconut and Moisturising Milk, and Palmolive Smooth Delight with Macadamia Oil, Cocoa and, of course, Moisturising Milk. The olive shower cream is addictive – in a good way. I love the warm, yet green fragrance, and I think this shower gel is perfect for all seasons. It’s green enough to feel refreshing on a warm summer day, but it’s also rich and comforting on a wintry day. Lovely! The coconut shower cream smells absolutely divine. I think it doesn’t smell like coconut at all – but that’s a good thing in my book. 🙂 I can’t describe the fragrance but I’d say it’s tropical, warm, sensual and fresh – all at the same time. Perfect! The macadamia shower cream is a new favourite of mine. It smells warm, sweet and nutty – almost like a cake or a dessert. The fragrance is absolutely delicious! Hi there! 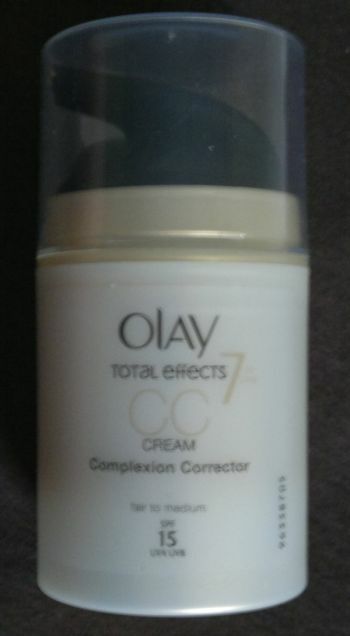 Some of you may remember that I’m a total Olay nut – so it was only natural that I picked up Olay’s CC Cream Complexion Corrector when I found it for half price. I’ve read dozens of reviews about this product after I bought it, and a lot of reviewers said that they didn’t like this moisturiser, so I was hesitant to try it. However, I tried it and I like it! And here’s why: Olay’s CC Cream feels smooth and silky on my skin, and it moisturises very well. As someone with dry skin I’m very happy with this product, but I can see that women with oily skin might prefer a lighter moisturiser. I think Olay’s CC Cream is a great base for make-up and it also doubles as a primer which saves time and money! I’m very happy about this. Saying this, I understand why some of the reviewers didn’t like this moisturiser. I have to say that it’s difficult to apply this CC cream evenly. So I usually end up with a few darker patches on my face. Because of this I wouldn’t recommend this CC Cream if you don’t intend to wear make-up on top of it. However, if you use a foundation after moisturising and if you don’t have oily skin, you’ll love the result! I think that Olay’s CC Cream really makes my make-up last longer. I guess it’s the rich, moisturising formula that helps make-up hold on to dry skin. In summary, I’m very happy with this product and I’m sure I’ll buy it again. This CC Cream feels amazing on my skin, it smells nice and it’s got SPF 15 – what’s not to like? Hi there. Today I’m writing about about one of my all-time favourite vanilla fragrances. It’s gorgeous, it’s cheap, it’s Yves Rocher Organic Vanilla Eau de Toilette. This wonderful vanilla fragrance is pure and authentic; it smells of real bourbon vanilla. Every time I spray it, I think of vanilla cake, cupcakes, candy, muffins and cookies. It’s the ultimate vanilla cookie dough fragrance! I also think it’s the perfect fragrant companion on cold winter days. It’s like a warm embrace in a bottle. Another bonus is that it’s quite longlasting. It easily lasts for about four to six hours on me (it lasts longer when layered over a body lotion or body butter – preferably a vanilla-scented one). Five sprays in the morning and five sprays on my lunch break are enough for the entire day. The delightful Yves Rocher Organic Vanilla Eau deToilette is available as 20ml for £5 or 100ml for £9.50. Have you tried this one? If not, what’s your favourite vanilla fragrance? Hi there! I know many people are obsessed with expensive shower and bathing products that promise a spa experience at home – and I can’t blame them. 😉 But I think that some of the drugstore products are just as good! 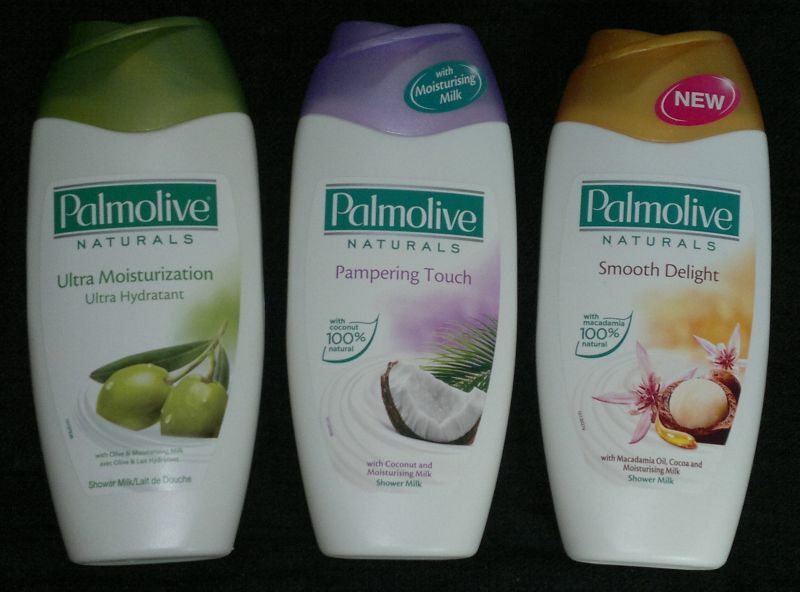 Just like everyone else, I too love to try different products all the time, but one brand I always return to is Palmolive. I just love their products because they’re gentle, they smell nice (Did I mention that I am also obsessed with scents?) and they’re good value! My skin is quite sensitive, so I like shower milks and shower creams that don’t leave my skin feeling tight and dry the moment I step out of the shower. And Palmolive shower creams are just great in this regard. My current favourites from left to right: Palmolive Irresistible Softness with Black Orchid and Moisturising Milk, Palmolive Delicate Care with Almond and Moisturising Milk, and Palmolive Feel Passionate with Passion Flower and, you guessed it, Moisturising Milk. I’m not going to rave about how gently these shower milks cleanse my skin, but I’m going to rave about their scents! 🙂 So, here we go. Palmolive Black Orchid joined the brand’s standard assortment a couple of years ago – and I’m glad it did. I would describe its scent as a feminine, warm and velvety veil of black orchid and cashmere. Heavenly! Palmolive Almond is a classic that has been around for decades. It’s got the most wonderful sweet almond blossom scent I have ever encountered. It’s divine! 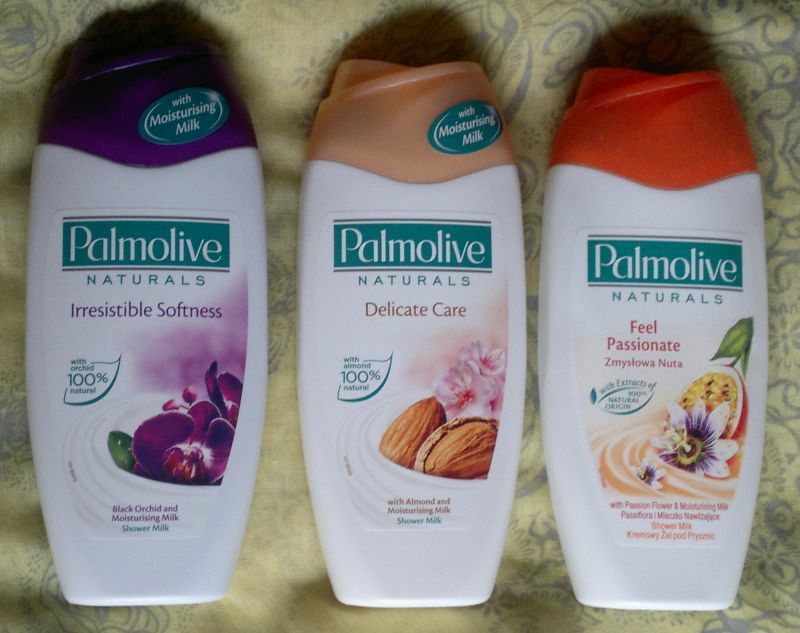 Now, Palmolive, can we please have the matching almond body lotion back? My third favourite is a limited edition, Palmolive Passion Flower. It’s no longer available at the big supermarkets or drugstores, but some of the discount stores still have it. The scent is really gorgeous – it’s youthful, floral and fruity and it bursts with sweet juiciness. Yummy!